Are you in need of Bronze Bell Manufacturer in Indianapolis Indiana? Smith Bell and Clock Service provides nationwide Bronze Bell Manufacturer Repair & Provisioning and service to our clients in Indianapolis as well as clients all over the USA. Bronze bell manufacturing has been around for many centuries. After experimenting with different mixtures of metal and alloys, it was found that a good mixture of copper and tin was the most advantageous for producing a sweet sound. Similarly, the way we manufacture bronze bells today at our shop is the same traditional method completed years ago. 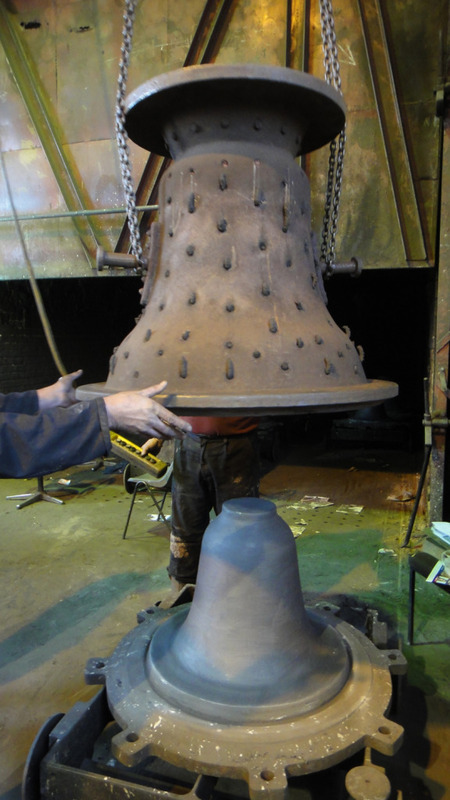 Our craftsmen dedicate several days or weeks preparing the mold, depending on the size of the bell. The mold is the most important part of the process. A sweep or strickle is used to make the desired mold. Decorative inscription can be added, as well as the Bell Manufacturer’s name and or client’s name. When the magic happens, a furnace is used to melt bronze ingots. For most bells, the temperature of the metal is around 2150 degrees F. The whole pouring process is very quick. However, done correctly, the bell lasts for centuries. Working with 200 year old bell foundries, Smith’s Bell has perfected the profile and shape of the bell to produce a beautiful bronze bell. After the casting is performed, the mold is broken apart and cleaned to head to the tuning shop. Metal is shaved from the bell at various parts to produce the rich sound of the bell. We tune the bells to A=440 in 5 partials. The partials in the bell are the hum tone, prime (or strike note), minor third, fifth, and octave. Although there are more harmonics involved here, these are the most basic and give the bell their plaintive sound. Different shapes and profiles have been developed to ultimately suit the end user. Carillon bells, specifically, have to be tuned precisely to produce harmonies with other bells. Want to see a bell casting by one of the Nation’s last Bronze Bell Manufacturer? Contact us now! If you are in need of bronze bell manufacturer assistance, then call an experienced and knowledgeable company like Smith’s Bell & Clock Service. Call us today at 317-847-4092.